If you are looking for a way to escape the bounds of dry land and set off seeking adventure on the high seas then I have something you need to see! Let me introduce you to Wyuna, the Steber 41 flybridge cruiser. First launched in 1989 under the name Freedom machine, she is built to be comfortable yet capable and will be the perfect vessel for all your adventures. 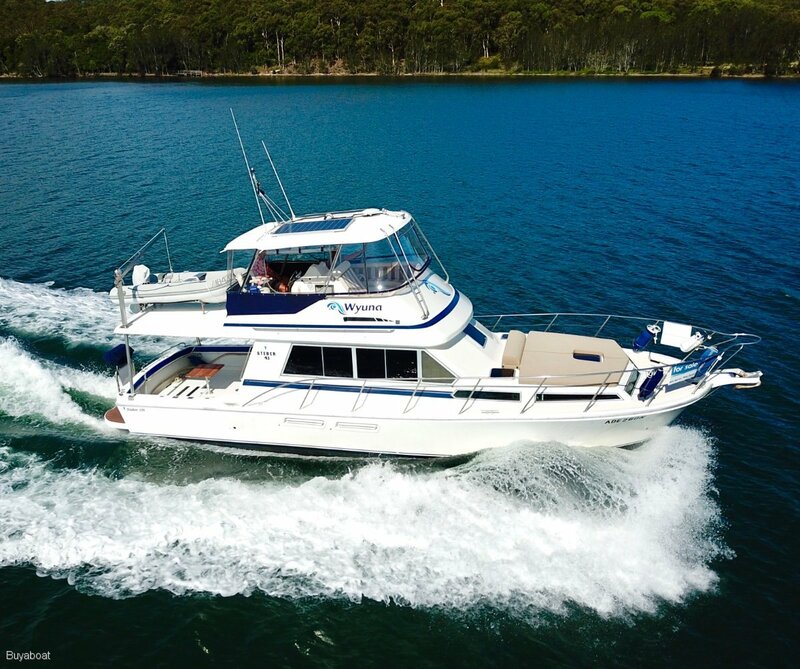 Wyuna is the idea boat for day trips, weekends away, or extended cruising, she can do it all! A prime example of the renowned Steber sea-worthiness Wyuna has been confidently cruising the east coast of Australia as a home-away-from-home, for her very lucky owners. They are very sad to see her go, but own two other boats and simply don't have the time to properly enjoy the extended trips that Wyuna is built for. Wyuna boasts many upgrades, with the most prominent being her two new 420 hp Yanmar engines, new ZF gearboxes and fuel tanks. Rest assured, these are not crate motors installed by someone's brother-in-law. They were fitted by the Steber factory to ensure all work was kept to a level in keeping with the excellent Steber reputation. The engines have only 500 hours on them and will give you many years of worry free cruising and easy maintenance. The large kitchen with hotplate, oven, microwave, fridge/freezer and oodles of storage is equipped for cooking home-style meals while out on the water, and the custom installed Cesarstone benchtop looks stunning and is so easy to keep clean. In keeping with her extended cruising pedigree the lower helm has been removed to make way for an additional large fridge, giving plenty of room for provisions when you are away from land for a week or two. The dining table can accommodate 4 people, and the additional lounge pulls out into a bed for extra guests. Out the back there is a huge cockpit with plenty of room for a large table, seating, or storing gear. The hard roof provides protection from the sun and rain and the full fly-screens keep the pesky flies and mosquitoes away. The bow has a huge sun lounge perfect for soaking up the rays, champagne In hand. The forward cabin has a full sized queen bed, which lifts on gas struts to reveal a gigantic storage locker, with plenty of room for all your extra gear. There are also two wardrobes and a flat screen TV, with plenty of windows to give the cabin a very bright and airy feel. The huge queen bed is easily accessed from both sides, so no crawling over each other like some V-berths. The second cabin has two good sized bunk beds, perfect for the kids, or grandkids, and there is also a wardrobe and flatscreen TV. Upstairs on the flybridge there is plenty of seating, including a moulded lounger built into the front of the helm station. The controls are perfectly set to make handling her an absolute pleasure, with a very positive yet gentle engagement and ideal speed at idle. The addition of a bow thruster takes the stress out of docking in wind and makes picking up moorings very easy. Her Sirrocco tender with 15 hp Yamaha outboard sits in a secure cradle on the roof behind the flybridge and is raised and lowered by a crane, which means easy launch and retrieval. No messing around with davits or risking losing the dinghy while towing it along behind. Wyuna will be freshly antifouled with propspeed applied, and have her 500 hour engine service prior to sale. If you have been dreaming of adventures on the water or cruising off into the sunset it's time to wake up! Wyuna is ready to give you access to a lifestyle that most only ever get to dream about. Contact Sean on 0468 601 210 or at Sean@buyaboat. Com. Au to discuss making this beautiful vessel your own, but be quick, with this list of features she won't stay on the market for long. Large Galley with huge bench space and ample storage. Upgraded to custom Ceasarstone benchtops, appliance cupboard, dishwasher, cooktop, over, microwave, two fridge/freezers. Full cover for dinghy, outboard, crane. Master vvolt battery charger, 2 Lifeline AGM batteries for house, 2 start batteries, dedicated battery for bowthruster, VHF radio, 27MHS radio, 2x 24v solar panels which charge the batteries. Electric BBQ, Underwater lights, Wifi router, Clothes dryer.